M. B. Manthe is a LibraryThing Author, an author who lists their personal library on LibraryThing. See M. B. Manthe's author page. About meHmmm...depends on what day it is. ;-) To cover the basics: I'm the librarian for Kansas State Dept. of Transportation (see my Favorite Libraries below). I'm married and have two sons, ages 18 and 16. I'm originally from Massachusetts, received my BA in English from Smith College in 1995, and my MLS from University of Arizona in December 1997. I worked as a cataloger here in Topeka (my husband's hometown) for a little over a year after we got married and relocated here from Tucson. I liked the work, but not the situation - it was a private company, not a library. I finally became a "real" librarian when I started at KDOT in Sept. 2003. Overall, my life is good, far better than my upbringing would have predicted. As far as the day-to-day, though, I'm often moody and stressed out. Reading cheers me, and I wish I had more time for it. FOR THOSE WHO ASK, WHAT EXACTLY IS A HEATH MOCHA FROST? 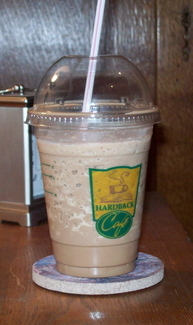 It's my favorite beverage, a frozen blended chocolate coffee concoction (see photo this page) served at the Hardback Cafe in my local Hastings store. Sigh. About my libraryThe contents of my library owe a great debt to Clifton Fadiman and his "Lifetime Reading Plan." I have the third edition, and the "New" fourth edition which includes Eastern classics. I found the book in early spring 1995 at the Attleboro Public Library (back in my hometown in the year between Smith and Univ. of AZ) - that was the SECOND edition. Between that list and all the books I acquired as an English major at Smith, I've managed to collect a great many more classics than I've had time to read. But I do enjoy most of the classics I read, and will put in my LT catalog ONLY those books (literature or otherwise) that I plan to keep and still want to read someday. A note on the Collection "Verified": I started using that to indicate that the edition described matches the book I actually own. If I confirm the ISBN (or lack thereof) and publication info, then it goes into this collection. Most of the editions in the Collection called "To Verify" are PROBABLY correct, but I'm just trying to get the books entered and I'll fuss with the details later! ;-) Books in "To Verify" that have the tag "edit edition" indicate the edition in my catalog probably DOESN'T match the book I have, and I need to correct it when time allows. Groups1001 Books to read before you die, Audiobooks, Board for Extreme Thing Advances, Bookmarks, Books on Books, Bug Collectors, Depression and Anxiety: Books That Help, Early Reviewers, Geeks who love the Classics, Girlybooks —show all groups, Group Reads - Literature, I Love Gov Docs, Librarians who LibraryThing, Librarything Local, Reading Great Books, Romance - from historical to contemporary, The Brontës, What the Dickens...?